On April 16, 2016, two weeks after the first Fiesta de Colores in San Vicente, a 7.8 magnitude earthquake struck coastal Ecuador, killing over 600 people and destroying hundreds of thousands of homes and businesses. 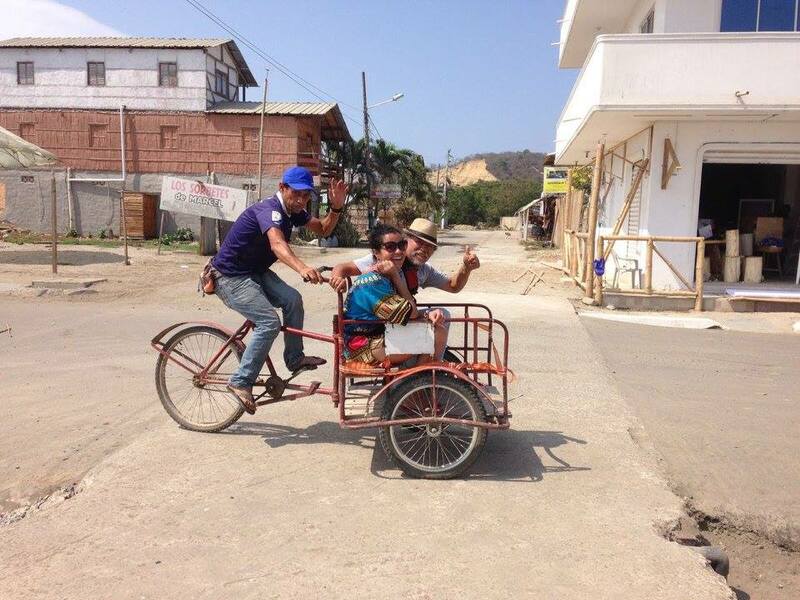 One of the hardest hit areas was Canoa, a small beach town in the province of Manabí. Over 80% of Canoa's infrastructure was destroyed, killing more people per capital than in any other affected city, crippling the local economy and leaving it's inhabitants homeless, unemployed, and traumitized. Rodrigo teamed up with Miguel de la Cueva, co-organizer of Canoafest and the bassist for Descomunal, to aid in the rebuilding effort by organizing a benefit concert in Quito to collect supplies and donations. Two months later, after the debris had been cleared and the physical rebuilding process began, the people of Canoa were left with a heavy emotional and mental scar, and a collapsed tourism economy. Rodrigo, Miguel, and Kristy joined forces to aid in the emotional, psychological and financial rebuilding process and organized a mural festival that aimed to lift the town's spirits, as well as the local economy, and provide Canoans with an outlet to process their trauma, celebrate their identity, and rebuild their town collaboratively with visual art and color. 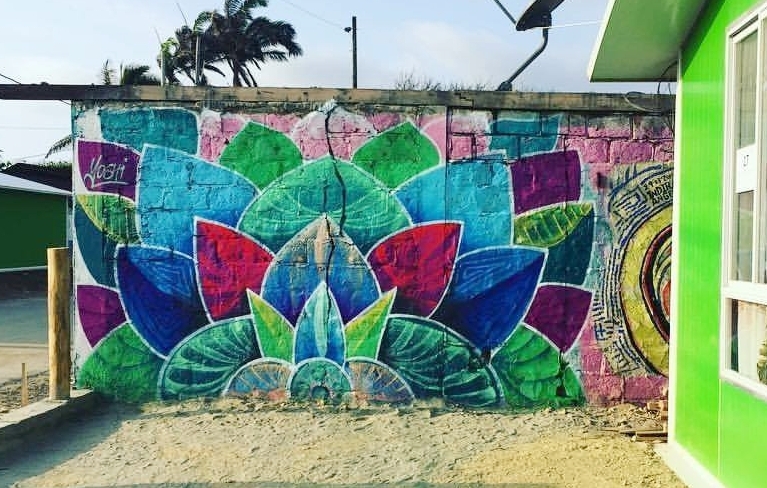 Six months later, in November of 2016, a group of 25 international and national artists gathered in Canoa to attend workshops about the history and culture of Manabí, and collaborate with local artists and community members in the creation of an outdoor art gallery, painting over 30 large-scale murals in 7 days. The result was a beautiful encounter of minds and cultures. 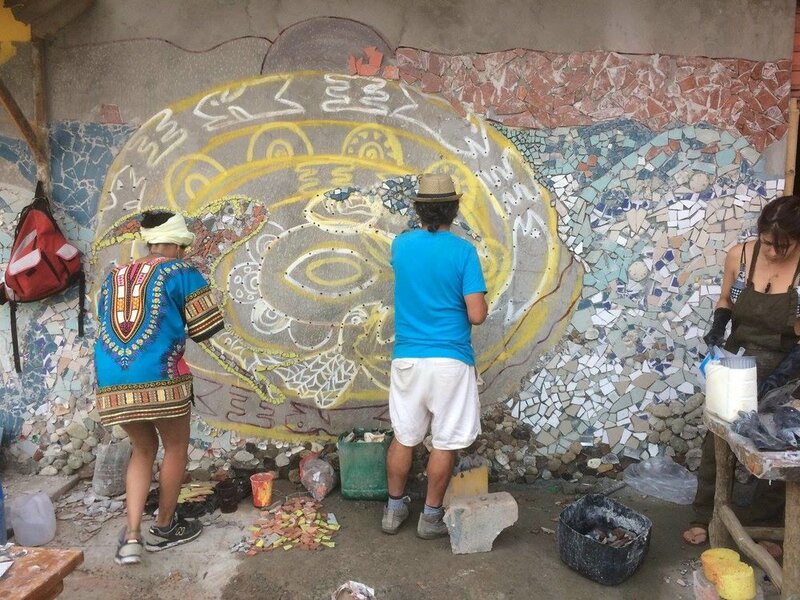 For the community of Canoa, where there was little access to art programming even before the earthquake, participating in and witnessing the colorful transformation of their town was an inspiring experience. The flourish of activity and the beautiful murals that resulted brought the first sign of hope that tourism would return and people could get back to work and move on with their lives. For many people, the process of creating the murals was therapeutic and empowering, helping them to honor lost loved ones, celebrate their identity as well as beautify their new public spaces. For the local artists, it was a way to earn respect from their community by playing a valuable role in the town's rebuilding process, and an opportunity to connect with and learn from talented artists from other parts of the world and develop their skills. And for the other artists, it was an inspiring and eye opening experience to see first-hand the healing power of their art; to build relationships with other talented artists from around the world, and to be immersed in the culture of Manabí and Ecuador. After 7 days of painting, bonding, learning, and building, the murals were completed and presented formally to the people of Canoa. The children of Alga Robos Elementary school hosted a parade of traditional dancers and a theater performance, followed by the inauguration of the mural that they had created over the week during three workshops led by Kristy. The other 30 murals were unveiled that evening and celebrated and presented to the community with a guided walking tour, led by 8-year old Kelly Coello Farfan.